Memoir writers are forensic historians, attempting to reconstruct the stories buried in the past. Take for example, Sandy Hanna, a marketing executive and artist, looking forward to retirement, Her childhood must have seemed like a distant dream. But the mystery of those times called to her, begging to be told. In fact, her military father “The Colonel” ordered her to tell the story. He wanted to let others know that just before the Vietnam war started, there were levers of choice and power that could have averted the catastrophe. If only we had applied wisdom instead of force. Her adventure began in 1960 when her family lived in Saigon. While her father investigated the feasibility of the United States military involvement in that remote part of the world, this ten year old girl had to figure out how to grow up. Thanks to the less protective parenting style of those times, and the hyper-resourceful instincts of kids who grew up in the military, Sandy’s older brother figured out how to start a small black-market business. The little girl discovered her brother’s scheme and threatened to expose him unless he cut her in on the action. She didn’t need the money. She just had a thirst for adventure. If she had been in the States, she might have been playing jacks or hopscotch. In Saigon, she entertained herself by selling baby powder and chocolate at a street market among the locals. She came home looking all innocent to her unsuspecting military parents. Her precocious business venture provides a fascinating variation on the resourceful way kids everywhere can get themselves into trouble. But when you take into account that her coming of age occurred in the epicenter of the coming war, the story takes on a deeper meaning, shrouding the innocence of her childhood in the shadows of one of the great conflagrations of modern times. A few years after her escapades, college campuses would explode with screams to stop the war, and the verdant jungles of Vietnam would explode with the screams of those who were participating in it. Protesters, police, soldiers, displaced civilians, and the many millions touched by the counter culture were all swept up in the chaos. Now, at last, almost 60 years later Hanna offers Ignorance of Bliss, one of the gutsiest, quirkiest tales of coming of age I have read, complete with mystery, with a brilliant, cunning child-hero, a colorful cast of characters (including a pet monkey), and a feel-good ending too cool for me to risk spoiling. 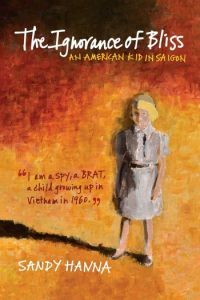 A little girl’s view of Saigon, from inside the home of a top military attache, bursts with insight into the delicate balance that holds civilization together, shows how small actions can create large results, and how coming of age in a crazy world often requires a bit of craziness in response. The whole thing would look terrific on the big screen. Many boomers who saw such a movie might walk out of the theater with a nagging need to reconstruct their own stories about growing up during that era. At first, you might recoil from such a desire. Our culture is saturated with evocative symbols of that era such as Woodstock, the Beatles and Cheech and Chong on the fun side and all the hellish images of foot soldiers in jungles on the bad side. But in reality, we have far less understanding of the introspective experience of the individuals who had to make sense of their own lives during that period..
For most of the hippies, soldiers, Jesus freaks, Hari Krishnas, stoners, groupies, Hell’s Angels, dropouts, and any of the other menagerie of counter-cultural extremes, those years have always seemed better left buried. The whole thing was so embarrassing and confusing, that in order to return to a normal life, our whole generation allowed itself to hide behind the clichés..
As boomers take stock of where we’ve been, our first memories often reinforce the clichés and embarrassment. Such first-glances are far too simplistic to do justice to our intricate passage tinto adulthood. A book length memoir is the only medium rich and deep enough to convey those inner journeys. If you accept the challenge posed by Sandy Hanna’s memoir, you will find yourself immersed in one of the most important activities in civilization. Civilization requires the steadying influence of the longer view of history, which can only be seen through the eyes of elders. From the stories of people who grew up in the midst of those changes, we learn so much from each other about the way humans respond to the forces of history. And by sharing these psychologically rich narratives, you will be offering your life to increase our collective wisdom, one story at a time. A soldier in the thick of combat, horrifies himself. A great look at the horror of being a soldier, and a great prelude to the return to sanity memoir Offtrack. After the crushing psychological trauma of combat in Vietnam, McGarrah uses the horse people who run race tracks as a sort of half way house to return to society. Click here. for brief descriptions and links to other posts on this blog. This entry was posted in 60's and tagged Boomers, Ignorance of Bliss, memoir, Sandy Hanna, sixties, Vietnam by jerrywaxler. Bookmark the permalink.